The Stream Machine Water Launcher TL-500 is designed to allow the smallest members of the family to join in on te fun! At only 8 inches, it's great for those ages 3 to 8 years. But it still packs the same punch as it's big brothers. 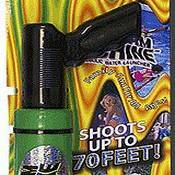 it's perfect for around the pool.Shoots up to 70 feet !Re-Load Faster than your water battle apponent.